Although in these pages Nephi is not exactly quoting Isaiah like he did before (2 Nephi 12-24), he is relying on the teachings of Isaiah heavily to teach about the coming forth of his writings (2 Nephi 26:15; 27:6-22) and the Restoration of Christ’s Kingdom on the earth (2 Nephi 27:24-26). The Book of Mormon was the forerunner to the Restoration. It was during the translation process that Joseph and Oliver received the Priesthood and 12 major revelations contained in the Doctrine and Covenants. The Book of Mormon is not only inspired writing that must be studies by the Spirit of Inspiration, but it is also a catalyst for inspiration. As I read the Book of Mormon I am constantly inspired by not just the words that I read, but more particularly by the Spirit that is invited to accompany me and teach me. One one occasion, as Joseph Smith taught the Brethren, he stated that the Book of Mormon is “the keystone of our religion”. A keystone is the central stone in an arch. It holds all the other stones in place, and if removed, the arch crumbles. 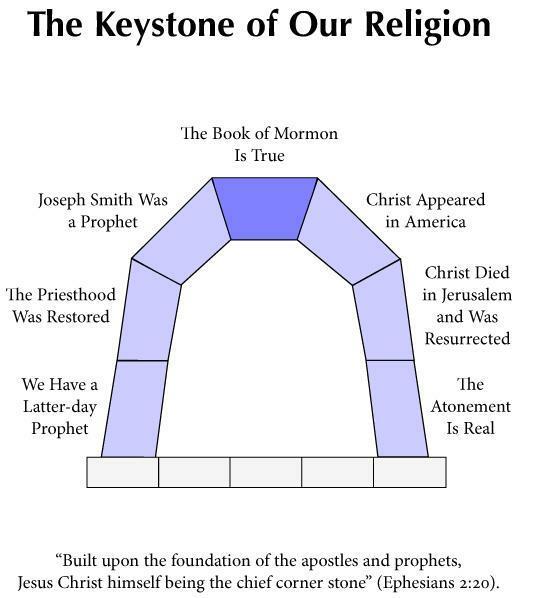 Just as a keystone holds an arch in place, knowing that the Book of Mormon is true holds together the house of faith built on the sturdy foundation of apostles, prophets, and the Lord Jesus Christ. For example, one cannot fully accept the Book of Mormon without also accepting the means by which it came forth—the Prophet Joseph Smith. President Ezra Taft Benson taught, “There are three ways in which the Book of Mormon is the keystone of our religion. It is the keystone in our witness of Christ. It is the keystone of our doctrine. It is the keystone of testimony.” (CR, Oct. 1986, 4–5; or Ensign, Nov. 1986, 5–6) I have found this Keystone to be TRUE and FAITH-FILLED, and I am eternally grateful for that witness! Although in these pages Nephi is not exactly quoting Isaiah like he did before (2 Nephi 12-24), he is relying on the teachings of Isaiah heavily to teach about the coming forth of his writings (2 Nephi 26:15; 27:6-22) and the Restoration of Christ’s Kingdom on the earth (2 Nephi 27:24-26). The Book of Mormon was the forerunner to the Restoration. It was during the translation process that Joseph and Oliver received the Priesthood and 12 major revelations contained in the Doctrine and Covenants. The Book of Mormon is not only inspired writing that must be studies by the Spirit of Inspiration, but it is also a catalyst for inspiration. As I read the Book of Mormon I am constantly inspired by not just the words that I read, but more particularly by the Spirit that is invited to accompany me and teach me. Although in these pages Nephi is not exactly quoting Isaiah like he did before (2 Nephi 12-24), he is relying on the teachings of Isaiah heavily to teach about the coming forth of his writings (2 Nephi 26:15; 27:6-22) and the Restoration of Christ’s Kingdom on the earth (2 Nephi 27:24-26). The Book of Mormon was the forerunner to the Restoration. It was during the translation process that Joseph and Oliver received the Priesthood and received 12 major revelations contained in the Doctrine and Covenants. The Book of Mormon is not only inspired writing that must be studies by the Spirit of Inspiration, but it is also a catalyst for inspiration. As I read the Book of Mormon I am constantly inspired by not just the words that I read, but more particularly by the Spirit that is invited to accompany me and teach me. I have found this Keystone to be TRUE and FAITH-FILLED, and I am eternally grateful for that witness!